I have had a couple of people inquiring about using card kits -- whether I like them and if so, why. Honestly, I'm fussy ... I've tried a few card kits and thus far, the only one that I just love is The Card Kitchen kits by Jillibean Soup. I like their style. I like that they typically include 10-12 full sheets of 12x12 paper or a full 6x6" paper pad. I like the die cuts and embellishments that come with them. And why use them? Well, I feel they keep my creative mojo going. Some days, we just don't have the ooompfh, you know? When a kit comes in (always the first week of each month, assuming I pay using PayPal promptly), I like to sit and read the instructions first, and then cut each of the card's papers at once. For each of the 8 cards, I put the cut pieces and the planned embellishments into the cello bag that will eventually hold the finished card. 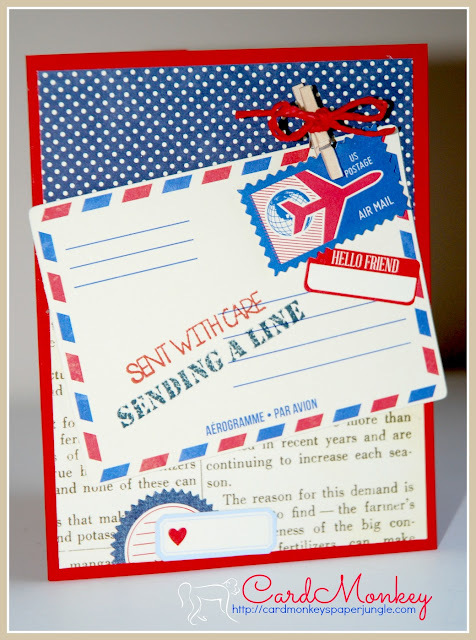 The Card Kitchen kits also include the card blank and envelope, so that goes into the corresponding cello bag as well. You may also have noticed that sometimes I change up the design of the kit card. I may add Rumple Ribbon, or buttons, or CTMH Liquid Paper. I might change the sentiment as well, or add my own die cut that changes up the card's plan entirely. The nice thing, it's totally up to you! For this card I show here, I've made it exactly as the designer planned it for The Card Kitchen. Once all the pieces were in their cello bag, when I make it, a card like this flies together -- less than 5 minutes! Wouldn't these be great to take to a crop or party, so you'd only have to bring along adhesives and scissors? I love kits too - thanks for sharing your thoughts! super cute! I am getting your mobile view on my desktop again!